A powerful and gripping new adaptation of the iconic 1968 Yorkshire-based Barry Hines novel, A Kestrel for a Knave. Set in the Playhouse’s temporary pop-up theatre, this two man stellar cast captivate the audience from the opening scene. Although it dramatically differs in style and order from the well read book and the later Ken Loach film, the gritty bleak realism of a Northern town, renowned for the pits that peppered the landscape, is still central to this contemporary hard hitting production. Adapted for the stage by Robert Alan Edwards, the 70 minute single act performance, poignantly explores Barry Casper’s (Lucas Button) unique relationship with his beloved kestrel. He is accompanied by his older self, wonderfully performed by Jack Lord, who also doubles up as the the downtrodden teenager’s brother, teachers, mother and newsagent boss, creatively swapping characters at breath taking speed. Although it’s initially slightly confusing which character Lord is actually playing, it doesn’t take long for his multi-functional role to become apparent. The story tells of the harsh and bleak life of down trodden 15-year-old Billy, who is relentlessly bullied by his brother, Jud, and neglected by his mother’s care free lifestyle – where the highlight of her week is a night down the local club, drinking herself into a stupor and consequently forfeiting basics such as egg and milks to feed her sons – indicative of the harsh realities of a downtrodden hand to mouth society. At school Billy is the target for his overly zealous teachers, and experiences first hand the harsh realities of a 1960’s capital punishment style education where a regular caning or a freezing shower was considered an acceptable form of discipline. Scenes skip between very dark and harrowing moments where Billy is humiliated by Jud and his cruel teachers to beautifully poetic moments where, despite the absence of a physical bird, there is no doubt, due to the actor’s wonderful reactions, of the solace the teenager finds in the kestrel. Kes is the only aspect of Billy’s life that brings him any joy. He lovingly and patiently tames the once wild bird, giving him a well deserved and much needed break from his bleak and lonely life until a cruel act ends this beautiful relationship. As Lord plays Billy’s older self he continually agonises over his earlier life and It becomes clear that no matter how much he tries to change the outcome his future, like so many others in the Barnsley town he lives, he is destined to a grim and dark life down the pit. 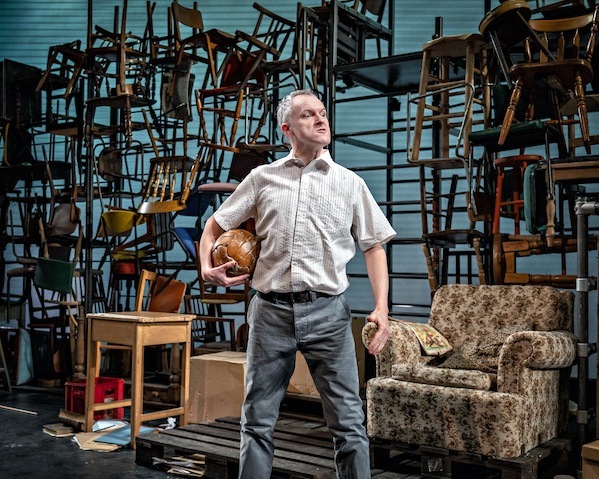 This is a brilliant piece of theatre, cleverly retold and due to the sympathetic taming of the language used, will appeal to any fans, young or old, of the Yorkshire classic, which 50 years on, has more than proved itself to stand the test of time.